Note that the graph is unscaled, and that frustrates interpretation. The text is also not very clear, a further frustration. It is easy to draw a graph… but is the graph inspired by a proposition or is it supporting evidence. The text hints that Z is measured at the antenna input at some frequency where R=23, X=0, and the indicated VSWR is 2.1. 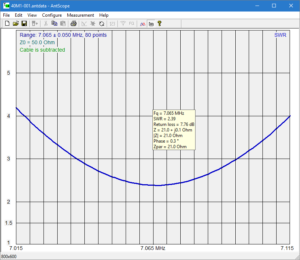 Alan correctly notes VSWR(50) for a load of 23+j0Ω is 2.17, so there appears to be some small error in the instrument’s display of one or more of the quantities. He goes on to state that increasing frequency a little the reactive component will increase (inductively) along with an increase in the resistive component . This behaviour is most unlike the feed point impedance of a heavily loaded mobile whip (as indicted by the value of R at resonance). Loaded short monopoles near resonance typically show a value of R (at the feed point) that changes only very slowly as frequency increases and X that changes relatively quickly with frequency from negative below resonance to positive above resonance. X increases from around -40Ω to +40Ω from left to right, a change of perhaps 80 times that of R.
The consequence of the fact that R is changing, albeit VERY slowly about resonance is that resonance (ie X=0) does NOT coincide EXACTLY with minimum VSWR. 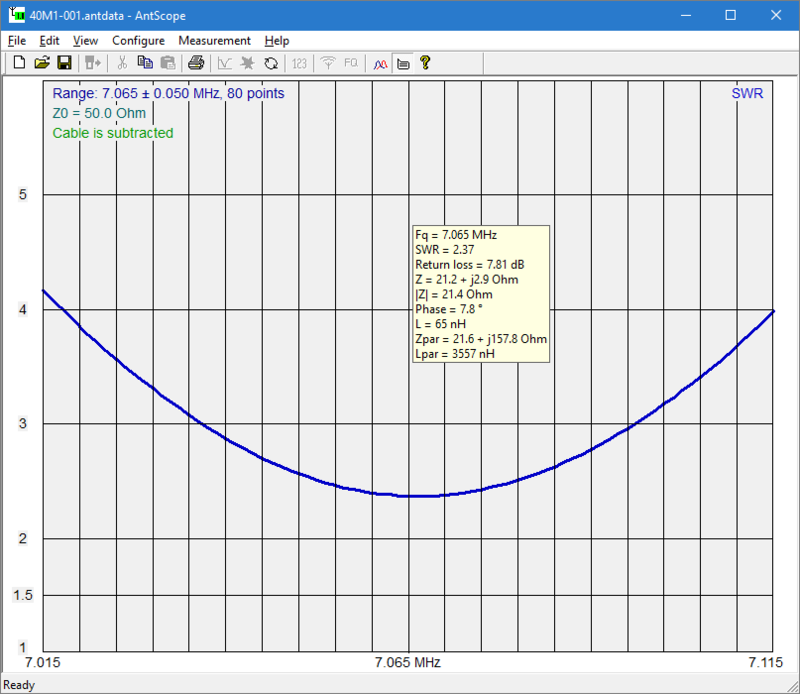 Resonance of the antenna is in this example indicated by X approximately equal to zero, and is at 7.065MHz, not one kHz higher or lower. 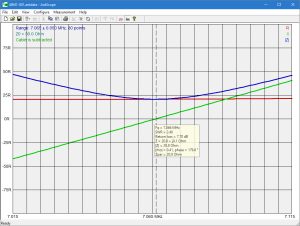 Alan’s point about measurement through 12″ (0.3m) of coax is not very clear. the plot of VSWR will be different, but by so little that you are unlikely to notice it in this type of scenario. 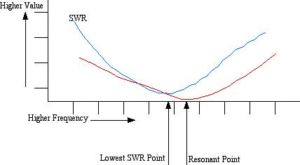 Above is the VSWR curve as would be observed looking into 0.3m of RG58A/U coax. If you look really hard, you will see that it is different, and most notably is that Zin at 7.065MHz (the resonant frequency measured earlier of the antenna) is 21.2+j2.9Ω. In fact, X=0 looking into that coax occurs at approximately 7.061MHz. Alan advises Because of this issue, the SWR readout of any antenna analyzer should be ignored while attempting to match a mobile antenna! 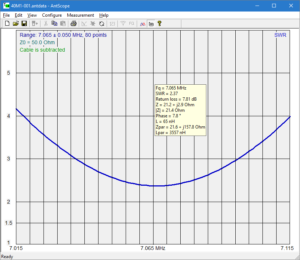 This example with real measurements of a real antenna demonstrates quite the opposite. 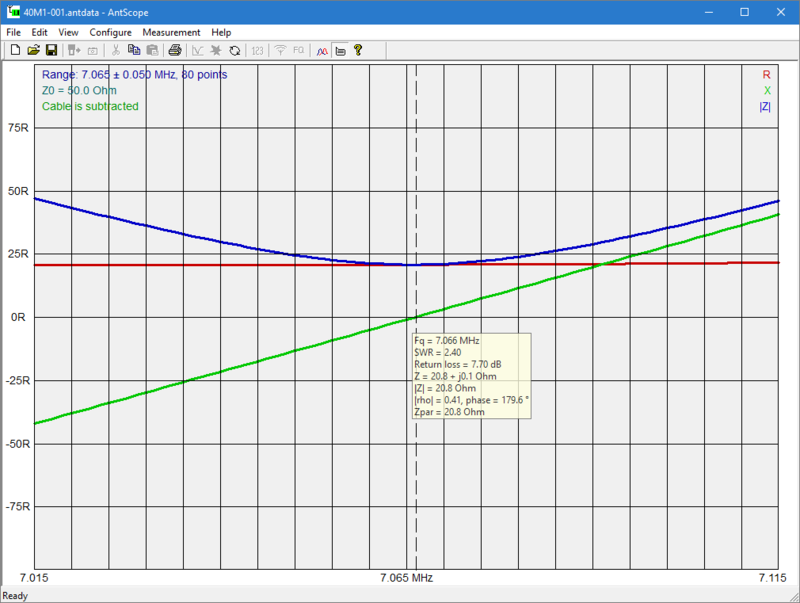 Looking into the coax, the best indication of resonance of the antenna is minimum VSWR looking into the coax. 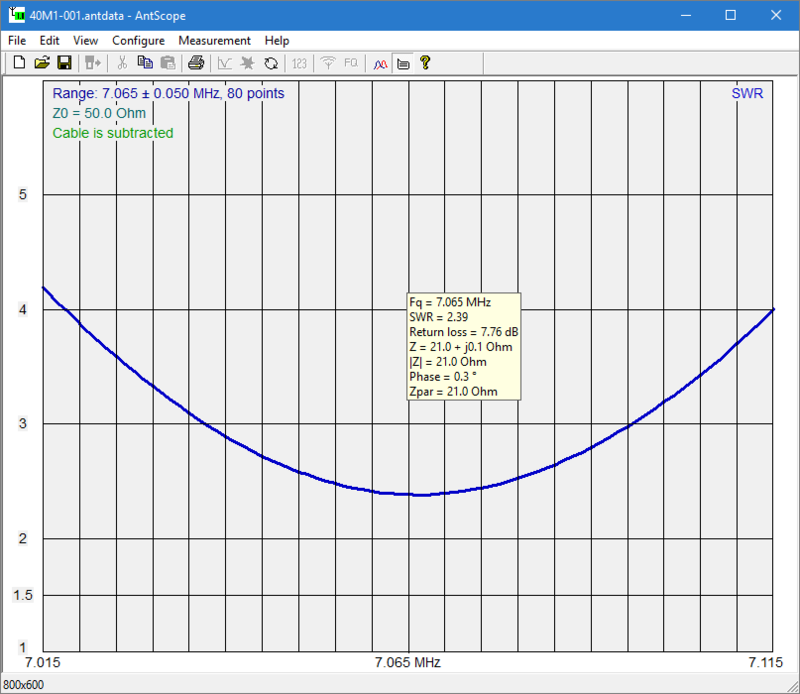 Indeed it is an error to tune the antenna for X=0 at an arbitrary remote point. Don’t take my word for it, get your antenna analyser out and conduct a careful experiment. Get familiar with the equipment you use. Make some similar measurements. Be careful that the measurements are valid, particularly that you do not disturb the thing you are measuring… that can give very confusing results (Exploiting your antenna analyser #9).